My Uncle and I decided to stay an extra night in Panguitch to take a semi-rest day and see Bryce Canyon National Park. 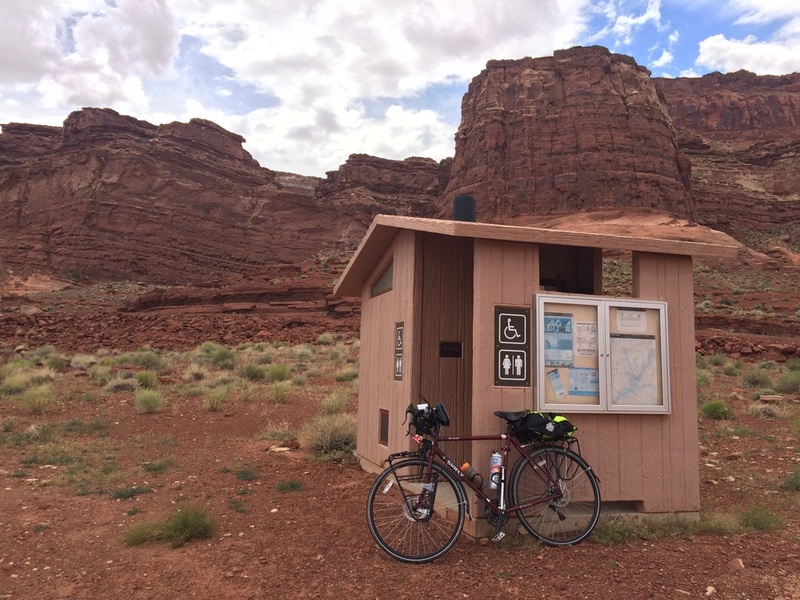 I slept in, enjoyed a greasy diner breakfast, and rode for several hours on a pleasant bike trail which roamed through the scenic Red Canyon, past towering cliffs and a scattered pine forrest, enjoying my first ride without the stress of traffic in a long time. I met my Uncle Don at Bryce Canyon and we stopped at the park lodge for lunch. The trail had been beautiful and quiet but consisted of mostly uphill terrain and I was ravenous. To my delight, they had a soup, salad, and sandwich buffet so I piled mounds of food onto my plate while I watched my Uncle try to eat a comically large salad he had ordered. We drove around to the various viewing spots and got out to snap some pictures. Swarms of tourists getting out of large tour buses and speaking a plethora of languages hummed around each viewing spot practically elbowing each other out of the way to snap pictures of the beautiful rocks. I circled around the edge of the canyon and away from the crowds to a quiet spot to have a reverential moment. I stood there alone and gazed down in amazement at the breathtaking display of brightly colored spires called Hoo Doos, which glistened magically under the sunlight with hues of reds, oranges, and whites. I pictured what it must have felt like for the Native Americans or early pioneers when they stumbled upon this sight. I forgot about checking my phone, or wanting to objectify this view by capturing more photographs, I just gazed at the beauty for a long moment, and found stillness. 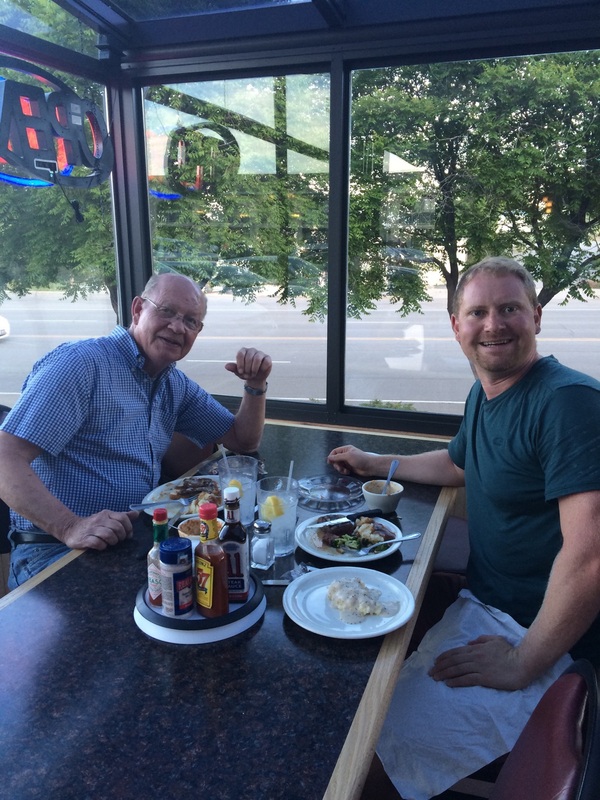 In the evening, my Uncle and I went to a little burger joint for dinner. Over burgers and malts, he shared stories about his and my dad's paper route when they were kids, building his first car from spare parts when he was fifteen, working in the steel mill between college summers, flying airplanes, my grandma and her strange hoarder ways, and his few memories of my grandpa, who was killed by a drunk driver when Don was seven and my dad was four. I couldn't believe how much about his and my dad's childhood I hadn't known, nor would ever have learned, if it weren't for my Uncle coming to help me on this trip. I went to sleep feeling grateful for the chance to get to know my Uncle better and learn more about my dad from his point of view. I could picture their happy childhood in Briar Hill, a suburban neighborhood in Ohio, swimming in the lake every day of the summer, playing baseball and football until it was time for supper. It sounded a lot like my childhood, before drugs and alcohol took over. I thought of the kids that never got to experience the kind of childhood that I did, swimming and biking and building forts in the peaceful mountains west of Golden. I thought of the kids in the foster system, tossed from one foster family to the next. I thought of the kids that only knew adults as the ones that do drugs around them and abuse them, growing up terrified of the very people they should be able to trust. I knew that in the morning I would wake up and be riding for them, so that they might feel what it is like to have a family, for that is what I felt when I lived at Providence House — family. A feeling of family is what it takes to overcome the stronghold of addictions. My motivation each day has stemmed from the fact that this sense of family will find its way to some kids through my ride, by helping fund a new recovery home for homeless youth and young adults. My uncle dropped me off where I had finished the prior day near Bryce Canyon and I watched the rock formations change their distinct color and shape around each bend. I found myself pondering all the years of weather patterns that had formed and molded each new set of wrinkled red and grey and white rock formations, marveling in their beauty. The dark clouds of the morning's ride erupted into a downpour of cold rain in the middle of the day which I fought through for a couple of hours until I saw my uncle waiving his arms in front of the "Pack Mule" next to a restaurant in Escalante. We enjoyed some locally-raised beef burgers while I warmed my body to try to pack in a couple extra hours of riding. The next day began with an adrenaline filled decent down a winding canyon with hair pin turns that left little room for error. I had been warned about the many cars that had tumbled off the side of the road so kept my hands firmly grasping my brakes. The decent was relatively ephemeral, and was followed by a hefty seven hour climb into Torrey, Utah. 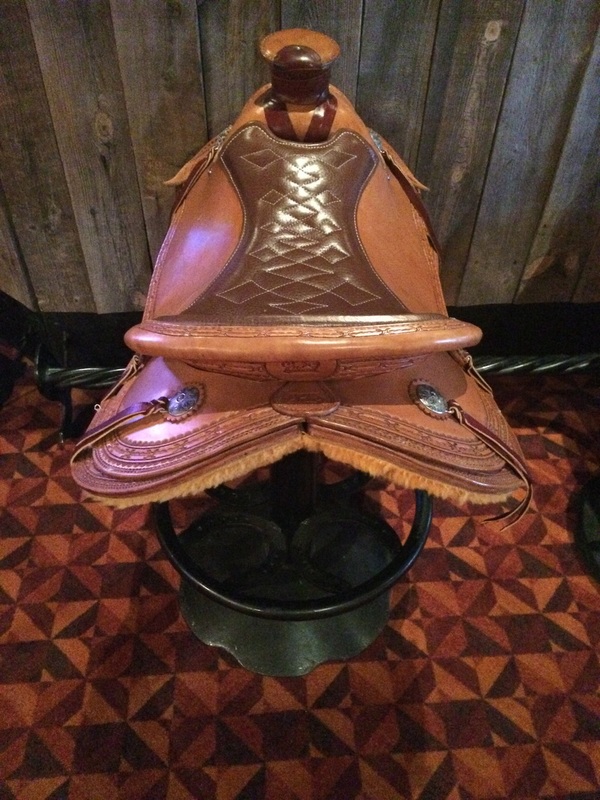 My Uncle and I ate dinner at an enormous Cowboy themed bar and grill with saddle bar stools, stopping to pose in front of a bull in the entrance way. The goal for the next three days was to split the mileage towards Blanding, having my uncle pick me up after 8 or 9 hours of riding and drop me back off in the morning at the same spot. My first day, as I was loading up my bike on the side of the road, two bulls mosied up to the side of the truck. I took one glance at their massive horns and wondered if my bright orange safety vest might be close enough to red to cause them to charge, making me into an accidental matador. My uncle jumped into the driver seat and frantically climbed over the console to the passenger side to let me in for protection. They continued up the road and I got on my bike while my uncle shielded me with his truck before they circled around the truck towards the side I was on. I coasted carefully around to the other side of the truck while my uncle idled slowly next to them as a barrier of protection. After making my way a safe distance from them, with a surge of adrenaline, I began my ride, and by evening, had made it a little past the Colorado River near Lake Powell. The next day I was determined to push it as hard as possible towards Blanding chasing the unlikely hope that I could conquer the multitude of climbs in one day, some as high as a 14 percent grade. I took little time to rest, only stopping to fill my water bottles at various planned spots that Don had stashed water, where I piled in mouthfuls of trail mix and beef jerky to keep my stamina. Much to my Uncle's surprise, I made it to Blanding before dusk and he treated me to a steak dinner for accomplishing the feat. I spent two days in Blanding, resting my tired muscles and letting my Achilles tendonitis heal while my Uncle made his way back to Scottsdale. I am so grateful for his help getting me through Utah and the chance I got to spend time getting to know him better. After a continental breakfast at the hotel of waffles and hard boiled eggs, I left Blanding for the Colorado border. My legs screamed from the weight I was carrying, which I hadn't felt in some time, as I was once again self supported and carrying my monstrous load. It was May 30th, an important milestone for me as it marked my seventh year of sobriety. I had downloaded an audiobook of the original version of Alcoholics Anonymous by Bill W, often referred to as "The Big Book," which I had actually never read in its entirety. I decided to spend the day reflecting on my sobriety and found an easy, meditative pace. In the early days of my recovery, I would pray for a day, or even a minute of sobriety at a time but over the years I have come to pray for a year at a time. I began my morning coasting out of the quaint town of Blanding, past a Dinosaur Museum, Mormon church, and various stores catering to adventure-seeking tourists, and with the deepest sincerity and humility, I asked God for another year of sobriety. Just then, I heard the soothing voice of the audiobook remind me that, "God is doing for us what we couldn't do for ourselves." It was true, at least as I saw it through my own spiritual lens. It felt like nothing short of a miracle that the burden of addictions had been lifted from me these last seven years. It was hard to believe that I could be so full of peace and joy without any substances. I thought of the Biblical significance of the number seven, the numerical symbol of fullness, completion, and perfection, and thought of Deuteronomy 15:1, which states: At the end of every seven years you shall grant a remission of debts. In the distance, I saw the sign staring at me from my beloved home state exclaiming, "Welcome to Colorful Colorado." I had made it home, and in so many ways the debts of all my mistakes and selfishness during my days of homelessness and addiction had been granted a remission. I had been forgiven by my family and friends, I had a career that I loved, a beautiful girlfriend, and hundreds of people cheering me on with prayers and well wishes as I set off each day to accomplish this dream of cycling America and helping others find their way towards rebuilding their own lives. Thanks for reading, sharing, praying, and donating to this journey and for all the love, support, and forgiveness these last seven years.